Spring has been particularly gloomy this year. And the weather isn't the only reason, as various scandals have shaken the little world of art, usually so unobtrusive. After the affair of the possibly fake Cranach in the Liechtenstein collection, the one involving 18th century furniture erupted in June, casting suspicion on a whole network of experts, galleries and a highly prestigious institution. Whether or not a coincidence, at the same time Paris saw a conference on expertise initiated by the Compagnie Nationale des Experts which, for lack of a legal status for the profession, called for a code of ethics. Meanwhile, the exemplary Comité Professionnel des Galeries d'Art could rejoice in the publication of its own: a praiseworthy initiative in a sluggish context, to say the least. But the bright spell didn't last long… On 23 June, the UK's departure from the EU clouded the future of art professionals still a little more. What effect will Brexit have? Should we fear further revelations of fakes? See you in September after the summer break for further exciting adventures! They're out. On 23 June, the British voted for the UK to leave the European Union. The violence of the debate, the aggressiveness and the death of a member of Parliament, together with the deep geographic and demographic divisions revealed by the results, have left the government and the British people at sea. Pierre Valentin is the founder and director in London of the law firm Constantine Cannon. 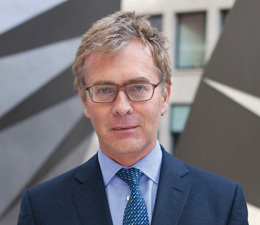 He himself is a specialist in the art market, Chairman of the Board of the World Monuments Fund Britain, founder of PAIAM (Professional Advisors to the International Art Market) and a board member of the Artists’ Collecting Society, the British equivalent of the ADAGP for the management of income from resale rights. Summertime on the Rock is a bit like Cannes but without the festival – or at least, without the films. This leaves the rich people, the fast cars and the luxury jewellery… Everything glitters in the sun, that's for sure! Several auction houses now specialise in these jet set events. The Monte Carlo saleroom (HVMC) is opening the proceedings on 17 July, continuing over the next two days with its jewellery sale at the Café de Paris. 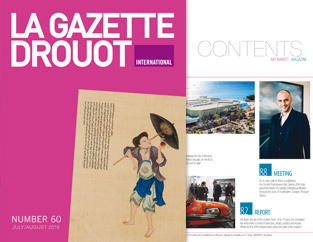 Asian Art week took place under rosy auspices in 2016, registering over €42 M on the French market: a speciality dominated by the €2.9 M obtained by an Imperial album in Toulouse, and a world record for a Japanese print from the Portier collection, sold at Drouot for €745,800. As its new code of ethics is published, the Comité Professionnel des Galeries d’Art talks about the issues of a rapidly changing profession through the voice of its president: Georges-Philippe Vallois. So how does the future look for artists and gallery owners? After the publication of the code of ethics for art galleries drafted by the Comité Professionnel des Galeries d'Art, the Compagnie Nationale des Experts opened its conference on expertise on 8 June, shortly after Bill Pallot and Laurent Kraemer were questioned by the OCBC (Office for the Fight against Trafficking in Cultural Goods). A tense atmosphere, with an auditorium full to bursting. Auctions, exclusive interviews, reports on the latests trends. to get a preview of future issues! Click and you're all set !